Published: Nov. 12, 2017 at 02:42 p.m.
Washington Redskins quarterback Kirk Cousins throws the ball over his intended receiver's head and is intercepted by Minnesota Vikings cornerback Mackensie Alexander. Published: Oct. 15, 2017 at 01:47 p.m. 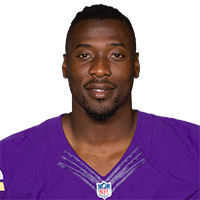 Published: Aug. 12, 2016 at 09:45 p.m.
Minnesota Vikings cornerback Mackensie Alexander records his first interception in the preseason.